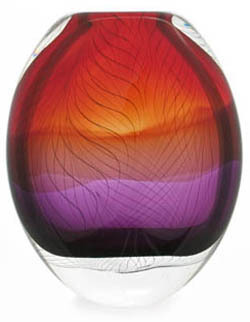 The Glass Blowing Art of Ola Hoglund is Inspirational. 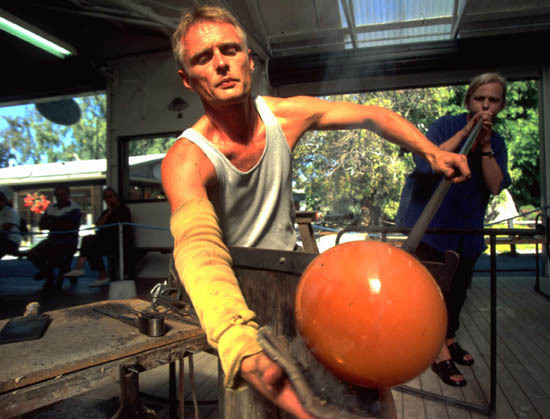 Ola Hoglund's renowned glass blowing art carried on his family traditions in Tropical North Queensland. 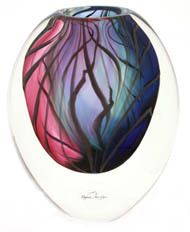 Trained in Sweden under the rigorous tutelage of master glassblowers and encouraged by his artist father, Ola has worked in New Zealand for many years, also spending part of each year in Australia. 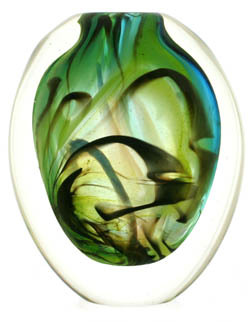 He now spends most of each year at his glass blowing studio in Otago, New Zealand. 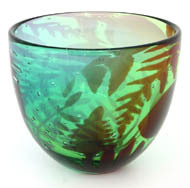 Hoglund Art Glass is collected world wide and Ola and Marie have received many accolades for commissions such as the America's Cup and the Sydney Olympic Games as well as New Zealand and Sweden's stamp issues. 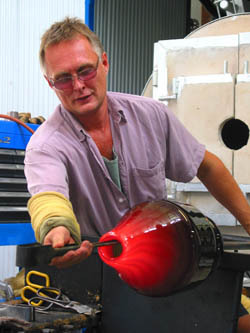 The gas fired glass furnace was slowly heated over a period of two weeks as Ola prepared his materials and glass blowing equipment for another season in the North Queensland studio that he shared with his artist partner, Marie Simberg-Hoglund. The furnace would continue burning day and night until the end of their residency when it would be slowly cooled and turned off. 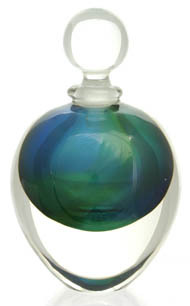 Pure silica sand from Tasmania is mixed with a flux of sodium carbonate, lime and other minerals to make clear crystal glass for glass blowing. The hollow, stainless steel blowpipe is readied, glass is melted in the furnace, jacks and shears laid out, wet paddles and newspaper prepared and designs planned. "You need to know exactly what you are making", says Ola, "everything needs preparation". 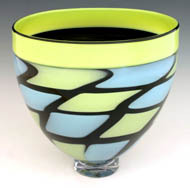 This planning extends to the coloured glass to be used, the heat of the glass furnace and of the annealing kiln where the finished piece is slowly cooled. 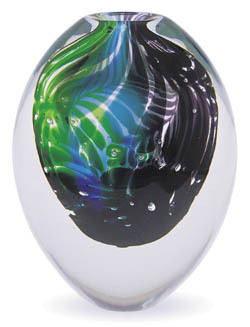 The history of glass blowing is almost lost in the mists of time, its origin thought to have been developed by chance around 2000BC as Phoenician sailors made camp fires on a river using pieces of sodium carbonate to support their cooking vessels. This flux reacted with the sand from the beach to form lumps of clear glass. 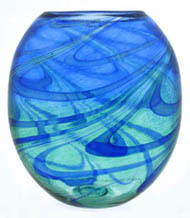 Glass has always been considered to be rare and precious, traded for gold, slaves and ivory, its forming techniques and materials a closely guarded secret until relatively recent times. 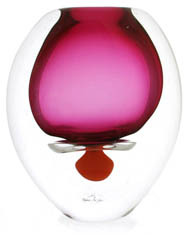 But, of course, glass is merely a substance without form until it is given life in the hands of a master glass blowing artist, such as Ola Hoglund. 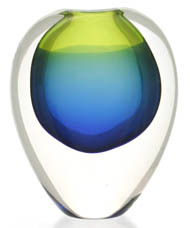 Ola constantly strives to improve on the previous piece that he has made so that the properties of the glass are given full rein to reach their potential of transparency, translucency, strength as well as fragility. An ethereal looking form often surprises with its dense heaviness, which seems to contradict its appearance. Gathering molten glass at the end of the blowpipe from the furnace, Ola rotates it to make a roundish shape then blows little puffs of air into it to make a bubble. 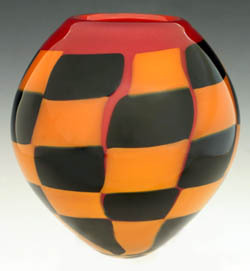 A kiln called a 'glory hole' is kept burning during working hours only and it is into this temperature controlled space that he re-heats his, now cooling, glass 'bubble' to keep it at a workable temperature as he continues to form the piece. 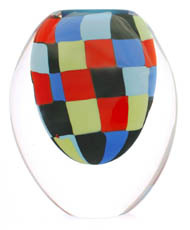 Pieces of coloured glass are picked up and incorporated into the design as the glass blowing art process takes over, the artist's brain, eye and soul working as one with his materials. Glass blowing demonstrations: Ola and Marie work as a team, blowing, turning and shaping. He repeatedly puffs air to make the form grow, shaping it with wet newspaper or a wooden paddle and re-heating it until he has the correct shape to finish it into a platter, vase or round bowl. The finished piece is put to cool in the electric annealing kiln. Initially this kiln is at the same temperature, approximately 490C, but at the end of the day's work it is slowly cooled over a period of 12 - 48 hours to reduce any stresses that could develop with more rapid cooling. Cutting and polishing then completes the piece, after which it is engraved, numbered and signed, ready for its special collector to find! 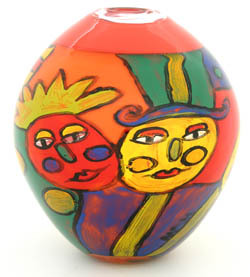 Then there's Hoglunds' speciality, the intricate painted or engraved graal glass, a collaboration between Ola and Marie. 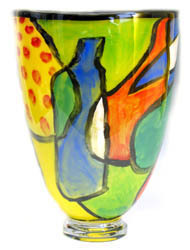 Marie usually paints, engraves or cuts patterns and designs into the small 'blanks' before Ola enlarges them with his blowing and turning techniques. 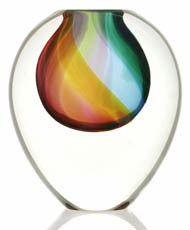 For details of the graal glass process please see here. 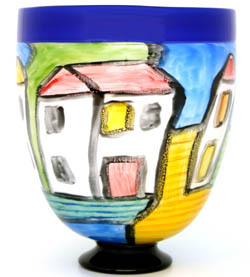 A painted graal vase or bowl (see examples, below) also starts life as a small bubble of glass onto which Marie paints colourful images. 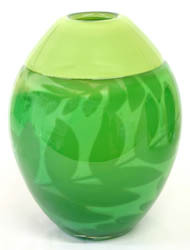 Ola then blows them larger and larger, adding coats of clear glass in the process. Fun, aren't they?